It's been a while since I put a new, well, old card up on the blog. So with Easter this weekend I thought this one would be good to share. It's an unusual one in my collection. I tend to look for those with stamps and frank marks. As signs of authenticity, the King's head and a postmark seem to permit us to believe the correspondents existed, and that a conversation took place. 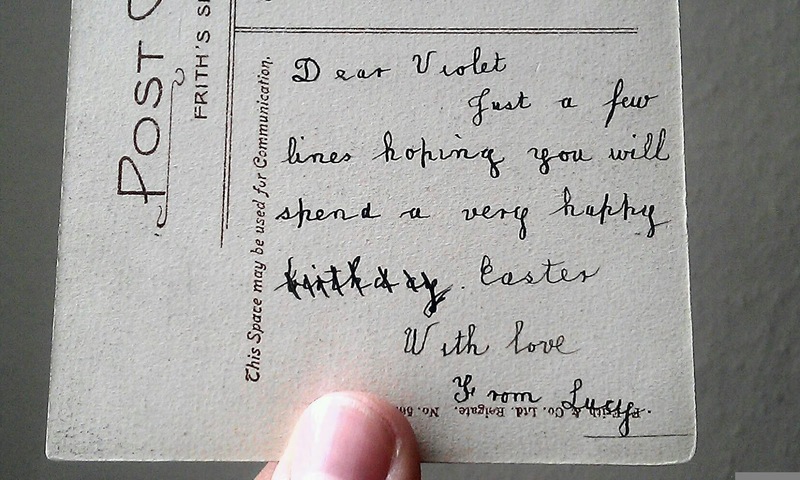 There's no stamp on this card to Violet. 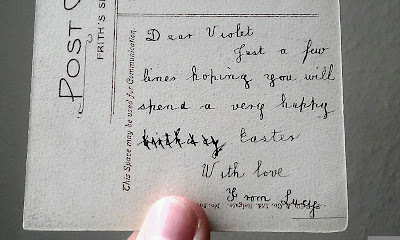 I bought it for Lucy's meticulous correction of her slip in wishing Violet happy birthday rather than Easter. 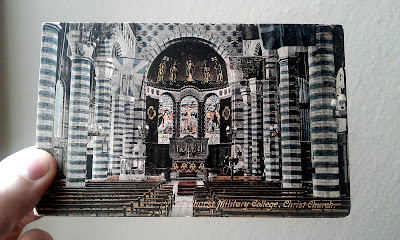 But looking again, where the stamp would have been, there are other signs that this is 'genuinely' (at least) a card produced in the Golden Age of postcards (1902-1918). First, the stamp requested is a half penny stamp, or a ha'penny green. Between 1870 and 1918 the postage rate for cards was half that of the penny postage rate for letters. Then, in a tiny upper case font, we see it was printed in Saxony where most cards were printed before the First World War. And of course, away from the top right hand corner, the format of the card fits with what we know of postcards after 1902. The 'Hartmann line' is in place down the middle, separating the address and message halves. As to whether the conversation occurred, we can't be sure - although can we really ever be? Certainly, without a stamp the card may not have been sent at all. It might have been delivered by Lucy or under the cover of an envelope, but we will never know. My hunch is Lucy thought twice about spending 1/2d on a card she'd so carefully prepared, until the moment her mind wandered. And happy Thanksgiving to you from this American! Yes we never really know if the card was actually received. I'd send it, even with that error. Happy Easter to you as well. Nice find! I like the story you've put together also. It makes sense. 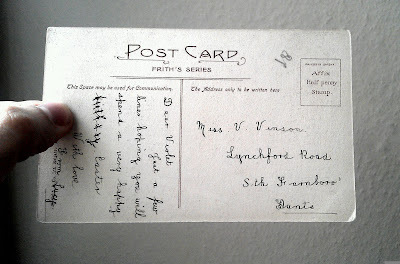 a classic Frith postcard! The Francis Frith Collection continues to publish photographs from the Frith archives to this day. Prehaps it was mailed from a post office that had run out of stamps. The post mistress accepting payment even though there was no stamp. but then why isn't there a cancellation. hmm, more to ponder. Fun find and I like the story you've put with it. Happy New Year! :D :D Happy PFF!